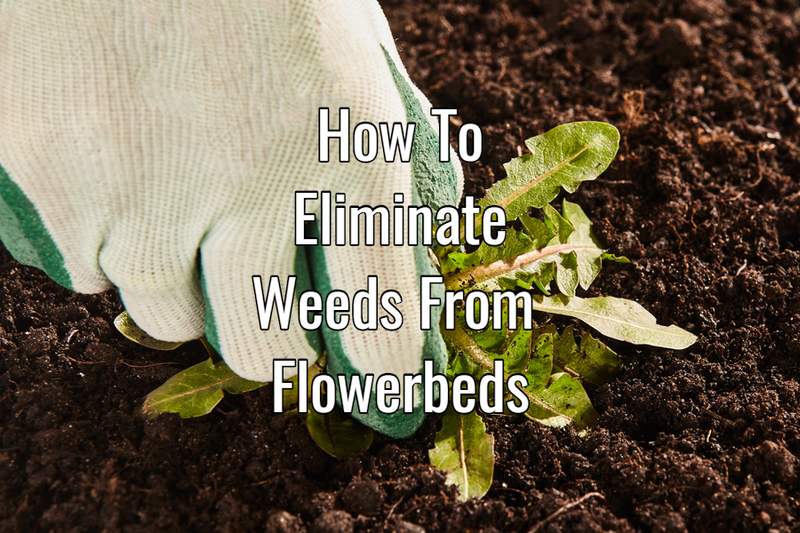 3 Simple Ways To Eliminate Weeds From Flowerbeds - For Good! 3 Simple Ways To Eliminate Weeds From Flowerbeds – For Good! There is nothing more frustrating than the constant battle to eliminate weeds from flowerbeds. Gardeners spend hours nurturing annuals and perennials to grow and bloom, only to watch unwanted weeds thrive without any care at all. Weeds are not only unsightly, they also steal valuable nutrients from the soil. Nutrients that annuals and perennials need to flourish and flower. But by avoiding a few common mistakes, and implementing a couple of simple techniques, you can eliminate weeds and keep weeding chores to a minimum. The best way to eliminate weeds from flowerbeds is to keep the soil surface covered at all times. Open soil is an open invitation to weeds. Weed seeds have easy access to the soil, where they can sprout and thrive. The easiest way to quickly and effectively cover soil is with mulch. Mulch serves a whole slew of valuable purposes in flowerbeds and gardens throughout the landscape. Not only does it provide a barrier for weed seeds, it also helps regulate soil temperature and conserve moisture. And for many mulches, they add valuable nutrients to the soil as they break down. One of the most common mistakes made when it comes to mulching beds is failing to put down enough mulch. Every time you disturb the mulch by turning, you replant weeds seeds laying on the surface. For many gardeners, heading out to stir up faded mulch in their flowerbeds is a great way to freshen up a bed’s appearance. Unfortunately, although it might make the mulch look a bit less faded, it also creates weeds. And a lot of them! Every time mulch is disturbed by raking and turning, you risk of re-planting weed seeds that have been laying dormant on the surface. Seeds are constantly blowing into flowerbeds from all over. They can also be dropped on the surface of the mulch from birds, other wildlife, and even via foot traffic. On top of the surface, weeds struggle to find the ability to sprout. But as soon as mulch is stirred, weed seeds can quickly find a home underneath below the surface. In the blink of an eye. they are sprouting in full force in the garden. Resist the urge to turn over mulch. Keep the mulch barrier in tact to keep weed seeds from finding soil. Instead, freshen up with an ultra light coat of new mulch every so often to keep weeds at bay. This also helps keep the mulch thick enough to repel weed seeds. Fill flowerbeds with plants to eliminate places for weeds to find a home. Not only does it cut down on weeding, it looks fantastic! Speaking of mulch, the absolute best mulch of all is living mulch! Instead of having wide open spaces that are begging for weeds to find a home, fill your flowerbeds full! Thick plantings of annuals and perennials are the best defense against crowding out and preventing weeds. And the benefits don’t stop there. Dense plantings help to conserve moisture in the soil, meaning less watering time for you. Maybe best of all, the less you need to mulch, the less mulch you have to purchase! Would you like to share your backyard garden or gardening tip on This Is My Garden? Email us today at info@thisismygarden.com, and you could be our next feature! This article may contain affiliate links. Growing Loose Leaf Lettuce – Grow Tasty Homemade Salads With Ease! January 27, 2018 ThisIsMyGarden Comments Off on Growing Loose Leaf Lettuce – Grow Tasty Homemade Salads With Ease! Growing Huge Pumpkins – Top Tips Methods For Big Success! October 13, 2018 TIMG Comments Off on Growing Huge Pumpkins – Top Tips Methods For Big Success!